A sports rivalry is intense competition between athletic teams or athletes, affecting participants, management and supporters  all to verying degrees, with the pressure perhaps felt strongest by the latter. The intensity of the rivalry can range greatly from a friendly/exhibition game and light hearted banter to serious violence. A rivalry that gets out of control can lead to fighting, hooliganism, rioting and some instances with career-ending and even fatal consequences. In "The football war", along with other factors, it was suggested to have been the tipping point in leading to military conflicts. Owners have been known to encourage rivalries as they tend to improve game attendance and television ratings for rivalry matches. Clubs can reduce fan aggression surrounding rivalry games by acknowledging rather than downplaying the conflict because the rivalry is an integral part of fan identity. Games between two rivals that are based in areas of close geographical proximity are often known as a local derby, or simply just a derby (UK: /ˈdɑːrbi/ DAR-bee, US: /ˈdɜːrbi/ DUR-bee); a sporting event between two teams from the same town, city or region. The term is usually connected with association football and the media and supporters will often refer to this fixture as Derby Day. 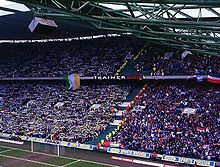 Fans separated at an Old firm derby in Glasgow, Scotland. The term "derby" possibly originated from The Derby, a horse race in England, founded by the 12th Earl of Derby in 1780. The 19th Earl has since claimed the Derby name was originally only given to one other sporting event: Rugby league fixtures between St Helens at one end of the family's Knowsley estate and Wigan at the other. The other theory as to the name's origin involves Shrovetide football, an early, unofficiated version of both association and rugby football. It was first played in the town of Derby prior to Medieval times. From as early as the 12th century it was known to have been played in Ashbourne. It was a chaotic and exuberant affair that involved the whole town, often resulting in fatalities. The goals were at Nuns Mill in the north and the Gallows Balk in the south of the town, and much of the action took place in the River Derwent or the Markeaton Brook. Nominally the players came from All Saints' and St Peter's parishes, but in practice the game was a free-for-all with as many as 1,000 players. A Frenchman who observed the match in 1829 wrote in horror, 'if Englishmen call this play, it would be impossible to say what they call fighting'. Shrovetide football is still an annual event in the town of Ashbourne. Since at least as early as 1840 'derby' has been used as a noun in English to denote any kind of sporting contest. Other names for derbies include Clásicos in certain parts of the world and crosstown rivalries in the United States. Rivalries do not always stem from the sharing of an area. Hostilities can occur for different reasons, such as in the case of El Clásico with tensions between fans with a background of historically cultural and political differences. Frequent meetings in important games between teams can also lead to unpleasantries. In Swedish bandy, derby games are often played on Saint Stephen's Day. Diablos Rojos del México (Mexico City Red Devils) vs. Tigres de Quintana Roo (Tigers) on a game named "Civil War Derby" ("Guerra Civil" in Spanish). Saraperos de Saltillo (Saltillo Sarapemaker's) vs. Vaqueros Laguna (Torreon Lagoon Cowboys) on a game named "Coahuila's Metropolitan Derby" ("Clásico metropolitano de Coahuila" in Spanish). Pericos de Puebla (Puebla Parrots) vs. Rojos del Águila de Veracruz (Veracruz Red Eagles) on a game named "Center rivalry" ("Rivalidad del centro" in Spanish). Diablos Rojos del México (Mexico City Red Devils) vs. Péricos de Puebla (Puebla Parrots) on a game named "Anahuac Derby" ("Clásico de Ánahuac" in Spanish). Naranjeros de Hermosillo (Hermosillo Orange Growers) vs. Tomateros de Culiacán (Culiacan Tomato Growers) on a game named "Derby of the Pacific Coast" ("Clásico del pacifico" in Spanish). Charros de Jalisco (Jalisco Charros) vs. Venados de Mazatlán (Mazatlan Deers) on a game named "Rivalry of the west" ("Rivalidad de Occidente" in Spanish). Although this rivalry is actually an international rivalry, it plays out within the Australia-based National Basketball League. The Breakers have been an NBL member from the league's formation. ROC Flémalle vs. Jeunesse Jemeppe (previously vs. Progrès HC Seraing). Union Beynoise vs. HC Herstal. JS Herstal vs. HC Herstal. Union Beynoise vs. HC Visé BM. Limburg derbies: HB Sint-Truiden vs. Initia HC Hasselt vs. United HC Tongeren vs. Achilles Bocholt vs. Sporting Neerpelt-Lommel vs. Kreasa HB Houthalen vs. DHC Meeuwen. Anvers derbies: KV Sasja HC Hoboken vs. Olse Merksem HC vs. DHW Antwerpen vs. HV Uilenspiegel Wilrijk. ^ European Sport Management Quarterly (2018). "Rivalry and Fan Aggression". European Sport Management Quarterly. 18 (4): 517–540. doi:10.1080/16184742.2018.1424226. ^ Berendt, Johannes; Uhrich, Sebastian (2016). "Enemies With Benefits". European Sport Management Quarterly. 16 (5): 613–634. doi:10.1080/16184742.2016.1188842. ^ "When a City Stops for Soccer". New York Times. 8 May 2015. Retrieved 11 October 2018. ^ "City's Shrovetide match give birth to 'local derby' phrase". Derby Telegraph. Archived from the original on 1 September 2013. ^ "Definition of derby". Collins dictionary. Retrieved 9 February 2015. ^ "One of the great British rivalries was in evidence at the 1980 Moscow Olympics. Steve Ovett and Sebastian Coe battled it out twice in the 800 metres and 1500 metres." "Top 10: Inspiring British Olympic Games Performances". AskMen.com. Retrieved 12 February 2010. ^ "Gay admits Bolt was not at his best after shock victory". More than the games. 6 August 2010. Archived from the original on 8 October 2011. Retrieved 6 October 2012. ^ "BBC Sport - Athletics - Asafa Powell & Tyson Gay set for London & Birmingham". BBC News. 2011-03-31. Retrieved 2013-12-08. ^ "Cuba's Robles Disqualified: A Painful Incident". Havana Times.org. 30 August 2011. Retrieved 2012-10-06. ^ a b c d e f Hattman, Patrick (1 August 2012). "Summer Olympics History: Top 10 Greatest Rivalries – Yahoo! Sports". Yahoo!. Retrieved 2012-10-06. ^ Ingle, Sean (6 August 2017). "Usain Bolt says he is still one of the greats after Justin Gatlin beats him in 100m". Theguardian.com. Retrieved 10 September 2017. ^ "Summer Olympics 2012: Highlighting Top 10 Must-See Rivalries Heading into London". Bleacher Report. 24 July 2012. Retrieved 2012-10-06. ^ "Ben Johnson, Carl Lewis and the drama of the Dirtiest Race in History | Sport". The Guardian. Retrieved 2015-10-10. ^ "Ondina e Claudia corsero col vento. E Bologna conquistò Olimpia" (in Italian). lastefani.it. Archived from the original on 18 February 2013. Retrieved 23 October 2012. ^ "Luigi Facelli (1898–1991)" (in Italian). sportolimpico.it. Archived from the original on 11 January 2016. Retrieved 29 October 2012. ^ "Grenada's Kirani James sets world leading time with dominant win at Diamond League". Jamaica Observer. 30 May 2015. Archived from the original on 7 January 2016. Retrieved 28 December 2015. ^ a b Morse, Parker (2 August 2012). "Kenya vs. Ethiopia". Runner's World. Retrieved 2 April 2016. ^ a b Gray, Will (13 September 2013). "The greatest rivalries in the history of sport (Part Two)". Sports.yahoo.com. Archived from the original on 19 April 2016. Retrieved 10 April 2016. ^ "Report: Women's long jumo qualifying - Sopot 2014". IAAF. 8 March 2014. Retrieved 17 July 2016. ^ "Shelly-Ann Fraser enjoying the rivalry between Jamaica and U.S". Reuters. 22 May 2010. ^ "US want Jamaica sprint showdown". BBC News. 7 March 2009. ^ "Other Headlines". trackalerts.com. 11 May 2009. Retrieved 2012-10-06. ^ Wilber, Randall L.; Pitsiladis, Yannis P. (June 2012). "Kenyan and Ethiopian distance runners: what makes them so good?" (PDF). International Journal of Sports Physiology and Performance. 7 (2): 92–102. doi:10.1123/ijspp.7.2.92. Retrieved 2 April 2016. ^ Tobias Jönsson (23 December 2014). "Annandagsbandy på SVT: "Större än julafton"" (in Swedish). SVT Sport. Retrieved 6 November 2015. ^ "Desde hoy vuelve la rivalidad entre el Escogido y el Licey". Diariolibre.com. Retrieved 22 November 2017. ^ "Licey y Aguilas se sacan las garras... literalmente". ESPNdeportes.com. 20 January 2014. Retrieved 22 November 2017. ^ "El Universal - - Diablos-Tigres... muere la guerra civil". archivo.eluniversal.com.mx. Retrieved 22 November 2017. ^ "Añeja rivalidad en playoffs, Puebla vs Diablos". MiLB.com. Retrieved 22 November 2017. ^ "Naranjeros-Tomateros, la gran rivalidad en LMP". ESPN.com.mx. 21 January 2014. Retrieved 22 November 2017. ^ "A la vanguardia con los mejores estadios en LMP". ESPN.com.mx. 21 January 2014. Retrieved 22 November 2017. ^ "Why All Blacks vs Wallabies has nothing on Breakers vs Wildcats". Thespinoff.co.nz. 2 March 2016. Retrieved 22 November 2017. ^ "Cibona Set up Zagreb Derby In League Finals - FIBA Europe Cup". Fibaeurope.com. Retrieved 22 November 2017. ^ "Split lands Darlon Johnson". Sportando.com. Retrieved 22 November 2017. ^ "Croatian Basketball A1 Champions League Started". Total-croatia-news.com. Retrieved 22 November 2017. ^ "EN VIDEO - Limoges-Pau, aux origines de la rivalité - SFR Sport". Sport.sfr.fr. Retrieved 22 November 2017. ^ "Pro A : Le derby pour Nanterre qui file en play-offs". Lequipe.fr. Retrieved 22 November 2017. ^ "Actualité Basket : toute l'actu Basket sur Boursorama". Boursorama.com. Retrieved 22 November 2017. ^ "Nancy s'est accroché, mais Strasbourg s'offre le derby de l'Est". Sport24.lefigaro.fr. 26 December 2015. Retrieved 22 November 2017. ^ "Nancy s'incline 72-80 face à Strasbourg : un derby de l'est à l'avantage des vice-champions de France". France3-regions.francetvinfo.fr. Retrieved 22 November 2017. ^ "Hapoel Tel Aviv - Maccabi Tel Aviv 26.01.2015". Ultras - Tifo. ^ "Basket A2, il derby a Natale Virtus-Fortitudo il 23 dicembre". Corrieredibologna.corriere.it. Retrieved 22 November 2017. ^ "Virtus-Fortitudo, ripescaggi lontani: in A2 il derby di Basket City". Bologna.repubblica.it. 6 July 2016. Retrieved 22 November 2017. ^ "Basket, Milano si prende derby e primo posto: Varese travolta". Repubblica.it. 24 January 2016. Retrieved 22 November 2017. ^ "Basket, serie A: Milano vince il derby con Cantù e resta capolista solitaria". Repubblica.it. 20 March 2016. Retrieved 22 November 2017. ^ "BASKET, SERIE A; VARESE-CANTU': DERBY APERTO A TIFOSI OSPITI - News Sport - Repubblica.it". Repubblica.it. Retrieved 22 November 2017. ^ "Treviso 'espugna' il PalaVerde e vince il derby contro Venezia". Sportando.com. Retrieved 22 November 2017. ^ "[DNG] Stella Azzurra Roma Vs Virtus Roma 74-78". Playbasket.it. Retrieved 22 November 2017. ^ "Tra Angelico Biella e Manital Torino il "derby del cuore" di Marco Atripaldi". Lastampa.it. Retrieved 22 November 2017. ^ "Virtus e Fortitudo contro la Pallacanestro Reggiana". Gazzettadireggio.gelocal.it. 10 July 2016. Retrieved 22 November 2017. ^ "Lebanese Basketball: Sagesse Crush Riyadi in Beirut Derby Sports 961". Sports-961.com. Retrieved 22 November 2017. ^ "Riyadi trounce Sagesse in 100th derby". Dailystar.com.lb. 6 February 2016. Retrieved 22 November 2017. ^ "A brief Youtube history of Zalgiris Kaunas Vs. Lietuvos Rytas". BallinEurope.com. 22 April 2010. Archived from the original on 17 September 2011. Retrieved 12 April 2012. ^ "Basketball: Rabotnički - MZT Skopje 05.11.2014". Ultras - Tifo. ^ "CSKA wins the derby versus Khimki - Eurohoops". Eurohoops.net. 8 February 2016. Retrieved 22 November 2017. ^ "Saski-Baskonia & Bilbao Basket players brawl in Liga AC match". BBC Sport. ^ a b c d e "Tennis, Tsumanis and Murder: The Greatest Ever Rivalries in Sport". Sport. UTV Media (213): 21–30. 24 June 2011. Archived from the original on 23 September 2011. ^ Zaccardi, Nick (18 February 2014). "Kaillie Humphries, Elana Meyers both want bobsled gold — and to race vs. men". NBCSports.com. Retrieved 22 January 2018. ^ Reynolds, Tim (18 January 2018). "At Olympics, bobsledding should find its next driving star". WashingtonPost.com. Retrieved 22 January 2018. ^ Claiming his title was stolen, an emotional Oliva challenged Schwarzenegger to a posedown at the 1973 Mr. International and to a weightlifting contest on TV's The Tomorrow Show, but the future California governor kept his cool and declined both duels. The Myth and the Oak's Nixon-era rivalry remains one of the greatest in bodybuilding history. Merritt, Greg. "15 biggest controversies and shocking moments in bodybuilding history" (February 2006). Archived from the original on 11 January 2016. ^ They fought three times with two of the brawls considered among the greatest fights in history... "The 10 greatest rivalries". ESPN. 4 January 2000. Retrieved 13 April 2010. ^ "The Sugar Ray Leonard Roberto Duran Trilogy Boxing Article". Saddoboxing.com. Retrieved 2012-10-06. ^ Richards, Huw (8 March 2008). "Cricket: Passion and politics mix as India faces Pakistan". The New York Times. ^ "Playing Australia - New Zealand cricket". New Zealand History online. newzealand.govt.nz. Retrieved 2013-12-22. ^ "Karachi, Lahore resume PSL rivalry". The Express Tribune. Retrieved 26 February 2018. ^ "Karnataka favourites in south India derby". Cricinfo. ^ "Royal Thomian Cricket Encounter". Royalthomian.info. 10 March 2012. Retrieved 2012-10-06. ^ "Lord's sells out for London derby". Lord's. ^ Cardus, Neville. "Beside the Roses the Ashes paled into insignificance". ESPN. Retrieved 27 August 2013. ^ "Warwickshire beat Worcestershire in FLt20 derby at New Road". BBC Sport. ^ Dyer, R. A. (2007). The Hustler and the Champ: Willie Mosconi, Minnesota Fats, and the Rivalry that Defined Pool. Guilford, CT: Lyons Pr. ISBN 978-1-59228-883-0. ^ Dyer, R. A. (2003). Hustler Days: Minnesota Fats, Wimpy Lassiter, Jersey Red, and America's Great Age of Pool. Guilford, CT: Lyons Pr. ISBN 978-1-59228-104-6. ^ Wanderone, Rudolph "Minnesota Fats"; Fox, Tom (2006). The Bank Shot and Other Great Robberies: The Uncrowned Champion of Pocket Billiards Describes His Game and How It's Played (rev. ed.). Guilford, CT: Lyons Pr. ISBN 978-1-59228-701-7. ^ "Too close to call?". CBC News. 12 November 2008. ^ "Opinion – Blogs – Our blogs have moved!". Communities.canada.com. 3 August 2009. Archived from the original on 3 June 2008. Retrieved 6 October 2012. ^ "Pictures of Coppi and Bartali are seen just as often. They hang in cycling shops, butcher shops, banks and shoe stores. The images and what they stood for have not been forgotten. The riders once divided the country, and they held social and political significance." JULIET MACUR (18 May 2009). "Long-Ago Rivalry Still Stirs Passion at the Giro d'Italia". The New York Times. Retrieved 16 February 2010. ^ "Cycling is not supposed to be a contact sport. Wrestling, yes. Rugby, yes. Cycling, no. But on a July afternoon in 1964, two Frenchmen rode up a mountain in a way unseen before or since. They literally went shoulder to shoulder, riding side by side, leaning into each other, neither yielding, in a tumultuous battle for supremacy that would decide the outcome of the 51st Tour de France." "Great Sporting Moments: Jacques Anquetil v Raymond Poulidor, Tour de France, Stage 22, Brive to Puy de Dôme, 10 July 1964". The Independent. London. 16 July 2009. Retrieved 16 February 2010. ^ Friebe, Daniel (2012). Eddy Merckx: The Cannibal. London: Ebury Press. ISBN 9780091943141. ^ MacGregor, Iain (2015). To Hell on a Bike: Riding Paris-Roubaix: the Toughest Race in Cycling. Random House. pp. 99–105. ISBN 9780552171311. ^ "'Slaying the Badger' (film documentary (2014) makes crystal clear that Hinault totally betrayed LeMond in his pursuit of an elusive sixth Tour de France title," "'Hell on wheels' – uncovering the rivalry between American cyclist Greg LeMond and his French La Vie Claire team-mate Bernard Hinault as they battled for supremacy in the 1986 Tour de France". London: The Guardian. 10 June 2014. ^ "Ah, I remember you: you're the guy who lost the Tour de France by eight seconds! No, monsieur, I'm the guy who won the Tour twice." Laurent Fignon (22 July 2010). "'You never stop grieving' – how the closest Tour de France was lost". London: The Guardian. Retrieved 22 July 2010. ^ "Obree's early career was marked by his rivalry with Englishman Chris Boardman in the mid-1990s. But for Obree to reach that position to challenge the Olympic gold medal winner was a victory of determination over adversity." Gordon Cairns. "Graeme Obree: Homegrown Hero". BBC News. Retrieved 16 February 2010. ^ "ESPN.com - MORESPORTS/TDF00 - Tour takes day off, but Armstrong rips Pantani". Espn.go.com. 2000-07-18. Retrieved 2015-10-10. ^ Robertshaw, Henry (22 February 2018). "Lotto-Soudal recruit Tom Boonen as advisor for 2018 season". Cycling Weekly. Retrieved 2 March 2018. ^ Donald McRae. "London 2012: Victoria Pendleton bows out after final Olympic showdown | Sport". The Guardian. Retrieved 2015-10-10. ^ William Fotheringham at the velodrome (7 August 2012). "Victoria Pendleton loses Olympic final as Anna Meares wins gold". The Guardian. London. Retrieved 2013-12-08. ^ Robin Scott-Elliot. "Victoria Pendleton and Anna Meares: Bad blood on the boards | Cycling | Sport". The Independent. Retrieved 2015-10-10. ^ "Tour de France: To wait or not to wait? That was the question surrounding Alberto Contador after Stage 15 – ESPN". ESPN. 20 July 2010. Retrieved 2012-10-06. ^ "Contador, Schleck create strong rivalry | PE.com – Press-Enterprise". PE.com. Associated Press. 24 July 2010. Retrieved 2012-10-06. ^ "Can Schleck ever beat Contador?". BBC News. 26 July 2010. ^ Hood, Andrew (30 October 2014). "Will 2014 see the last epic battle in the Cancellara-Boonen rivalry?". VeloNews. Retrieved 31 October 2015. ^ Benson, Daniel (18 December 2016). "Demol: Write Boonen off at your peril". cyclingnews.com. Retrieved 24 December 2016. ^ Pretot, Julien (28 March 2012). "Bauge not obsessed by Hoy". Reuters.com. Retrieved 31 October 2015. ^ Hobro, Scott (17 February 2015). "Trott ready to renew Hammer rivalry in Paris". British Cycling. Retrieved 31 October 2015. ^ Cary, Tom (1 September 2014). "Tour of Britain 2014: Mark Cavendish and Marcel Kittel set to finally go head-to-head". telegraph.co.uk. Retrieved 31 October 2015. ^ "Team Sky's Chris Froome spurred on by Alberto Contador rivalry". BBC Sport. 12 January 2015. Retrieved 31 October 2015. ^ Lowe, Felix (11 August 2017). "Blazin' Saddles: Adieu Alberto – Contador's best moments". Eurosport. Retrieved 10 September 2017. ^ "Schurter and Absalon rivalry resumes in Solothurn". cyclingnews.com. 2 May 2013. Retrieved 9 July 2016. ^ "Quintana and Froome set to renew rivalry in 2016 as Colombian targets Tour and Olympics". Cycling Weekly. 11 October 2015. Retrieved 9 July 2016. ^ Benson, Daniel (10 August 2016). "Bradley Wiggins: Australia our biggest rivals for Olympic gold". cyclingnews.com. Retrieved 11 August 2016. ^ Seaton, Dan (29 September 2016). "Mathieu van der Poel is just fine, thanks for asking". VeloNews. Competitor Group, Inc. Retrieved 24 December 2016. ^ Brown, Gregor (14 March 2016). "Greg Van Avermaet vs Peter Sagan: A new rivalry?". Cycling Weekly. Retrieved 26 February 2017. ^ "Bouhanni and Demare headline French team for World Championships". cyclingnews.com. 26 September 2016. Retrieved 25 June 2017. ^ Brown, Gregor (18 March 2017). "Michal Kwiatkowski: 'Some riders think Sagan's from another planet but I know he's beatable'". Cycling Weekly. Retrieved 17 September 2017. ^ "Na'vi vs the Alliance: Why This DOTA 2 Rivalry Is One Of The Best in eSports". 2013-11-12. Retrieved 2018-01-17. ^ "Alliance win 'El Classico' charity showmatch against Na'Vi - Esports by Inquirer". Esports by Inquirer. 2016-06-24. Retrieved 2018-01-17. ^ "OpTic Gaming vs FaZe Clan: Greatest Rivalry in Call of Duty?". Retrieved 2018-01-17. ^ "Black & White: the historic rivalry of SK Telecom T1 and Samsung White". Retrieved 2018-01-17. ^ "Samsung Galaxy wins Worlds, beats SK Telecom in the process – TNC Gaming". tncgaming.com. Retrieved 2018-01-17. ^ "pasha on rivalry with SK Gaming: 'Finally we broke them'". Retrieved 2018-01-17. ^ "RETAP: EPICENTER Finals | SK Gaming vs Virtus.pro". dbltap.com. 2017-10-29. Retrieved 2018-01-17. ^ John MacKinnon. "Field hockey rivalry draws huge crowd". Montrealgazette.com. ^ "At the Albertville Olympics in 1992 the Russian pairs came third and fourth in the ice dance, but this was purely a precursor to another kind of rivalry. Usova and Zhulin were an item, Grischuk and Platov were not. After the Olympics, Usova walked into Spago's restaurant in Hollywood, caught her husband sharing a cocktail with Grischuk, and promptly punched her rival in the face." Matt Tench and Jamie Jackson (3 November 2002). "The top 10 greatest rivalries in the history of sport". The Observer. London. Retrieved 16 February 2010. ^ "Yuna Kim claims that Japanese figure skaters ruined her practice jumps". Japan Probe. 18 March 2009. Archived from the original on 6 September 2012. Retrieved 6 October 2012. ^ a b c d e f g "Our Exclusive Ranking: 75 Best Rivalries in Golf (#1–10)". Golf Digest. 24 May 2010. Archived from the original on 30 May 2012. Retrieved 6 October 2012. ^ "Greg Norman weighs in on Tiger Woods, Phil Mickelson rivalry". Golf Magazine. 1 April 2009. Archived from the original on 11 January 2010. Retrieved 6 October 2012. ^ a b c d Illustration by Dan Vasconcellos (24 May 2010). "Our Exclusive Ranking: 75 Best Rivalries in Golf (#11–20)". Golf Digest. Archived from the original on 22 March 2012. Retrieved 6 October 2012. ^ a b c d "Our Exclusive Ranking: 75 Best Rivalries in Golf (#21–30)". Golf Digest. 24 May 2010. Archived from the original on 22 March 2012. Retrieved 6 October 2012. ^ a b c d "Our Exclusive Ranking: 75 Best Rivalries in Golf (#31–40)". Golf Digest. 24 May 2010. Archived from the original on 22 March 2012. Retrieved 6 October 2012. ^ a b Photos By Getty Images (24 May 2010). "Our Exclusive Ranking: 75 Best Rivalries in Golf (#41–50)". Golf Digest. Archived from the original on 22 March 2012. Retrieved 6 October 2012. ^ a b c d "Our Exclusive Ranking: 75 Best Rivalries in Golf (#51–60)". Golf Digest. 24 May 2010. Archived from the original on 22 March 2012. Retrieved 6 October 2012. ^ a b c d "Our Exclusive Ranking: 75 Best Rivalries in Golf (#61–75)". Golf Digest. 24 May 2010. Archived from the original on 22 March 2012. Retrieved 6 October 2012. ^ a b "The 10 greatest rivalries". ESPN. 4 January 2000. Retrieved 13 April 2010. ^ "Football, American-style, has a long history in Mexico". ESPN.com. 1 October 2008. Retrieved 22 November 2017. ^ "Universidad Autónoma de Nuevo León". Uanl.mx. Retrieved 22 November 2017. ^ "Historical Events on 18th October". HistoryOrb.com. Retrieved 2012-10-06. ^ "Battle of the QEW – The Globe and Mail". The Globe and Mail. Toronto. 12 November 2010. ^ Cory Toth – Encyclopedia Of Saskatchewan. "The Encyclopedia of Saskatchewan | Details". Esask.uregina.ca. Retrieved 2012-10-06. ^ "1949 Edmonton Eskimos - The Pro Football Archives". profootballarchives.com. 24 August 2015. ^ "Handball-Derby Bregenz gegen Hard: "3 Gründe, wieso mein Club gewinnt"". Vol.at. Retrieved 17 July 2016. ^ "LNH - J26 - Ivry remporte le derby face à Créteil - HandNews". Handnews.fr. 3 June 2016. Retrieved 17 July 2016. ^ "Handball / D1M : l'Usam Nîmes terrasse Montpellier (33-29)". Midilibre.fr. Retrieved 17 July 2016. ^ "Handball-Nachrichten - Gießener Anzeiger". Giessener-anzeiger.de. Retrieved 17 July 2016. ^ "Handball-Ostderby: Füchse festigen nach Sieg gegen SCM Platz fünf". Focus.de. Retrieved 17 July 2016. ^ "Handball - Handball-Ostderby: Füchse festigen nach Sieg gegen SCM Platz fünf". Ran.de. 18 May 2016. Retrieved 17 July 2016. ^ "Handball-Bundesliga: SG Flensburg-Handewitt besiegt THW Kiel". Sport1.de. Retrieved 17 July 2016. ^ "THW Kiel verliert das Nordderby 26:28 gegen die SG – KN - Kieler Nachrichten". Kn-online.de. Archived from the original on 23 July 2016. Retrieved 17 July 2016. ^ Tageblatt, Mindener. "Axner mit 62 Toren bester Werfer im Derby zwischen GWD Minden und TuS N-Lübbecke - Mindener Tageblatt - GWD Minden". Mt.de. Retrieved 17 July 2016. ^ "Handball-Bundesliga: SG Flensburg-Handewitt: Knapper Sieg im Nordderby gegen HSV Hamburg". Shz.de. Retrieved 17 July 2016. ^ "DKB HBL: THW Kiel gewinnt umkämpftes Nordderby gegen den HSV Hamburg". Sport1.de. Retrieved 17 July 2016. ^ "Are you ready for Hungarian derby - Szeged VS Veszprem (16hrs) - Handball Planet". Handball-planet.com. 25 October 2013. Retrieved 17 July 2016. ^ "Női kézi NB I: FTC–Győr, a döntő visszavágója". Nemzetisport.hu. 24 May 2016. Retrieved 17 July 2016. ^ "RK Vardar beat RK Metalurg in Macedonian derby - Handball Planet". Handball-planet.com. 5 May 2016. Retrieved 17 July 2016. ^ "Granollers y Barcelona escenifican el derbi catalán". Diariodeleon.es. Retrieved 17 July 2016. ^ "2017/18 EHF Champions League - Landing Page". Ehfcl.com. Retrieved 22 November 2017. ^ "Great Races: 1938 Seabiscuit vs. War Admiral Match Race". Regarding Horses. 18 February 2009. Retrieved 13 April 2010. ^ "Horse Racing's Greatest Rivalry: Affirmed vs. Alydar". Regarding Horses. 25 February 2009. Retrieved 13 April 2010. ^ "Horse Racing News - Racing News As It Happens - Racing Post". Racingpost.com. Retrieved 22 November 2017. ^ "A rivalry renewed: Indy vs. Fort Wayne – Indy Puck". Indypuck.com. Retrieved 22 November 2017. ^ "Rivalry Moves from the Ice Rink to the Football Field - OurSports Central". Oursportscentral.com. Retrieved 22 November 2017. ^ "Riots: LHK Prostějov – AZ Havířov 20.12.2014". Ultras-tifo.net. Retrieved 22 November 2017. ^ "Hradec Králové - Pardubice 04.02.2014". Ultras-tifo.net. Retrieved 22 November 2017. ^ "FotoReport: HC Poruba - Zubr Přerov". Supporters.cz. Retrieved 2015-10-10. ^ "Satakunnan derby Lukolle - "Päätöserässä selviytymistaistelua"". Yle.fi. Retrieved 22 November 2017. ^ "Satakunnan derby: Penkille pommitettu sensaatiovahti pois avauksesta". Iltalehti.fi. Retrieved 22 November 2017. ^ "MTV Sport: Jääkiekon Talviklassikko palaa Olympiastadionille". Yle.fi. Retrieved 22 November 2017. ^ "Tampereen derby perjantain herkkupalana". Jatkoaika.com. Retrieved 22 November 2017. ^ "Hockey : le premier derby Rouen - Amiens pour les Dragons". Tendanceouest.com. Retrieved 22 November 2017. ^ "Villard-de-Lans-Grenoble : les Ours remportent le derby ! (5-4)". Ledauphine.com. Retrieved 22 November 2017. ^ "Hautes-Alpes/Hockey: Retour sur le derby Gap Briançon, bilan 3 blessés à 0". Dici.fr. Retrieved 22 November 2017. ^ "Hockey : les Rapaces de Gap remportent le derby à Briançon (Coupe de la Ligue)". Lemedia05.com. 15 September 2015. Archived from the original on 1 December 2017. Retrieved 22 November 2017. ^ "Hokej.net - Sekstaśma rywala Pawła Droni wywołała skandal. "To nieludzkie"". Hokej.net. Retrieved 22 November 2017. ^ "Oilers sikret tittelen mot erkerivalen". Vg.no. Retrieved 22 November 2017. ^ "Sarpsborg Arbeiderblad - Sparta seiret i Østfold-derby". Sa.no. Retrieved 22 November 2017. ^ "Vålerenga best i Oslo-derby". Vg.no. Retrieved 22 November 2017. ^ "Over 7000 så Storhamar slå VIF: – Dette er helt sykt". Vg.no. Retrieved 22 November 2017. ^ Sæteren, Thomas Brekke. "Få med deg klassikeren Vålerenga - Storhamar tirsdag". Nettavisen.no. Retrieved 22 November 2017. ^ "HKm Zvolen - MsHK Zilina 24.01.2014". Ultras-tifo.net. Retrieved 22 November 2017. ^ "Hockey: MsHK Žilina – HKM Zvolen". Ultras-tifo.net. Retrieved 22 November 2017. ^ "MsHK Žilina - MHC Martin 18.01.2015". Ultras-tifo.net. Retrieved 22 November 2017. ^ "AIK - Djurgården 26.01.2012". Ultras-tifo.net. Retrieved 22 November 2017. ^ "Inför: Frölunda HC - Färjestad BK - Färjestads BK - SHL - SvenskaFans.com". Svenskafans.com. Retrieved 22 November 2017. ^ "Mora möter Leksand - i ett avgörande derby". Expressen.se. Retrieved 22 November 2017. Mora IK-Leksands IF". Globearenas.se. Retrieved 22 November 2017. ^ "Hett derby mellan Malmö och Rögle - KvP Sport". Expressen.se. Retrieved 22 November 2017. ^ "Skellefteå vann derbyt". Vk.se. Retrieved 22 November 2017. ^ "Sveriges hetaste hockeyderby - IF Björklöven - H-Allsvenskan - SvenskaFans.com". Svenskafans.com. Retrieved 22 November 2017. ^ "Följ säsongens sista derby mellan Sundsvall Hockey och Timrå IK här". St.nu. Retrieved 22 November 2017. ^ "Timrå vann heta derbyt efter förlängning". Aftonbladet.se. Retrieved 22 November 2017. ^ "Hockey: Kloten – Davos 07.12.2014". Ultras-tifo.net. Retrieved 22 November 2017. ^ "L'ultimo derby va all'Ambrì Piotta, Lugano piegato in rimonta". Heshootshescores.com. Retrieved 22 November 2017. ^ "11 dicembre 1964, il primo derby della storia tra Ambrì Piotta e Lugano". Agendalugano.ch. Retrieved 22 November 2017. ^ "Hockey sur glace : Suisse - National League - Suisse - National League : Fribourg (HC Fribourg-Gottéron) - Le derby des Zähringen pour le CP Berne - Hockey Hebdo". Hockey Hebdo. Retrieved 22 November 2017. ^ "Lions verlieren im Penaltyschiessen: Kloten überrascht im Derby". Blick.ch. Retrieved 22 November 2017. ^ "Kloten gewinnt das Derby gegen die Lions". Bernerzeitung.ch. 12 December 2015. Retrieved 22 November 2017. ^ "Bern - Biel 5:2: Aufsteiger Biel im Berner Derby ohne Chance". Blick.ch. Retrieved 22 November 2017. ^ "Bern gewinnt wenigstens das zweite Derby". Aargauerzeitung.ch. 17 October 2015. Retrieved 22 November 2017. ^ "EV Zug vs. HC Ambri-Piotta 5:4 n.P. (Video) - Ambri holt einen Punkt im Gotthard-Derby". Sport.ch.sportalsports.com. Retrieved 22 November 2017. ^ "Spektakuläres Ambri-Piotta entscheidet Drama gegen Zug mit dem 22. Penalty". Luzernerzeitung.ch. Retrieved 22 November 2017. ^ Bopp, Ulrich (30 November 2015). "Lakers gewinnen das Derby wieder". Zsz.ch. Retrieved 22 November 2017. ^ "Der ZSC verliert das Zürichsee-Derby im Penaltyschiessen". Aargauerzeitung.ch. 19 October 2010. Retrieved 22 November 2017. ^ "Ge/Servette s'incline après prolongation contre Fribourg-Gottéron (3-2)". Tdg.ch. Retrieved 22 November 2017. ^ "Hockey: Genève-Servette remporte le troisième derby romand en battant Fribourg-Gottéron - Vidéo - Play RTS". Play RTS. Retrieved 22 November 2017. ^ "Chur-Sieg im Bündner-Derby – nur ein Muster ohne Wert". Blick.ch. Retrieved 22 November 2017. ^ "EHC Chur gegen EHC Arosa: Vorfreude auf das Bündner Derby - GRHeute". Grheute.ch. 26 August 2016. Retrieved 22 November 2017. ^ "Lausanne dreht Léman-Derby gegen Servette vom 2:3 zum 5:3". Bzbasel.ch. 27 February 2016. Retrieved 22 November 2017. ^ "GE Servette remporte le derby lémanique". Lematin.ch. 22 November 2017. Retrieved 22 November 2017. ^ "Actualité - Viège: prélocation pour le derby valaisan - Planète Hockey". Planète Hockey. Retrieved 22 November 2017. ^ Campigotto, Jesse (24 February 2010). "Crosby, Ovechkin renew Canada-Russia rivalry". CBC Sports. ^ Allen, Kevin (21 February 2010). "Hockey day in Canada: Fever pitch for host nation vs. USA". USA Today. ^ Zaccardi, Nick (1 April 2013). "Examining U.S. vs. Canada women's hockey rivalry". Inside Olympic Sports. SI.com. Retrieved 17 December 2013. ^ Mike Zeisberger (January 4, 2011). "Canada, U.S. rivalry still strong | Hockey | Sports". Toronto Sun. Retrieved July 29, 2015. ^ Morreale, Mike (16 February 2010). "Czech-Russia rivalry defines blood feud". National Hockey League. ^ Lipka, Mike (20 February 2010). "Sweden-Finland Preview". Yahoo! Sports. ^ "Battle with Sweden is personal for Finland – NHL.com – All-Access Vancouver". National Hockey League. 20 February 2010. Retrieved 2012-10-06. ^ Stevenson, Dave (January 11, 2017). "Crosby vs. Ovechkin: 5 times Their Rivalry Was Everything to Hockey Fans". FanSided.com. FanSided Inc. Retrieved May 28, 2017. ^ "Orpik compares Ovechkin and Crosby, breaks down Pens-Caps rivalry". Sportsnet. Retrieved May 13, 2018. ^ Delaney, Brian (15 May 2009). "A New Stage for Cornell-Princeton Rivalry". Lax. Archived from the original on 26 April 2012. Retrieved 25 November 2011. ^ Hopkins down, but not out; If Blue Jays can get to .500, there’s a chance they could compete in NCAA tournament, The Baltimore Sun, 27 April 2010. ^ HOPKINS RAPS LOYOLA, 19-1; Lacrosse Game Mismatch From Start To Finish, The Baltimore Sun, 1 May 1963. ^ Loyola conquers Hopkins hex, The Baltimore Sun, p. 1C, 8 May 1994. ^ "Rivalry Day: Johns Hopkins and Maryland is the granddaddy of them all in lacrosse". Inside Lacrosse. 9 April 2008. Archived from the original on 14 December 2007. ^ Layden, Tim (9 February 1998). "Born To Luge Georg Hackl is a techno whiz, Markus Prock is a natural athlete. The Olympics have belonged to Hackl, the World Cup circuit to Prock. Now, the final act of one of the greatest, if most obscure, rivalries in sports is about to begin". Sports Illustrated. Retrieved 14 March 2016. ^ "Germany, again, will be the team to catch in Olympic luge". USAToday.com. 5 February 2018. Retrieved 3 February 2019. ^ a b c d e f g Sherdog.com. "Sherdog's Top 10: MMA Rivalries - No. 10". Sherdog. Retrieved 22 November 2017. ^ a b c d e f g h i j Smith, Sean. "10 Greatest Rivalries in MMA History". Bleacher Report. Retrieved 22 November 2017. ^ "Conor McGregor questions Jose Aldo's heart". Independent.co.uk. 8 April 2015. Retrieved 22 November 2017. ^ a b c d e "?". Octane (March 2010). ^ Don Sherman (August 2009). "Great Rivalries: Auto Union vs Mercedes Benz". Automobile Magazine. Retrieved 13 April 2010. ^ "Alfa Romeo – the History". Sportscars.tv. Retrieved 2012-10-06. ^ Scott-Elliot, Robin (15 May 2010). "The rivalry that caused the deadliest crash in motorsport". The Independent. London. ^ "Jaguar Plans". Motor Sport. August 1990. pp. 33–37. Retrieved 2 April 2016. ^ "1963 AC Cobra : Lot 283". Liveauctioneers.com. 14 March 2009. Retrieved 2012-10-06. ^ "FEATURES: Great Rivalries: Chevrolet Camaro vs Ford Mustang". Automobile Magazine. Archived from the original on 6 March 2012. Retrieved 12 February 2010. ^ "NASCAR Sprint Cup: The 20 Biggest Rivalries In NASCAR History". Bleacher Report. 12 December 2010. Retrieved 2012-10-06. ^ "Motor Sports Photo Library | The Rotary Engine". MAZDA. Archived from the original on 22 June 2012. Retrieved 6 October 2012. ^ Evanow 2005, pp. 28-39. ^ Gray, Will (21 February 2003). "Formula One: Big two fight rule changes". The Daily Telegraph. London. ^ Mossop, James (1 March 2001). "Formula One: Big two set to roar right from the off". The Daily Telegraph. London. ^ "What I'd Do Differently: Dennis Anderson". Caranddriver.com. ^ "Ganassi-Penske rivalry to flare up at 100th anniversary Indy 500 - Tim Tuttle -". Sports Illustrated. 25 May 2011. Retrieved 2013-12-08. ^ a b "Epic battles from 50 years of Touring Cars on TV". Telegraph.co.uk. 4 February 2014. ^ "Radio Control Car Action - August 2009". Rccaraction-digital.com. 2009-06-09. Retrieved 2015-10-10. ^ V8 Supercars boss Tony Cochrane says the Holden-Ford battle – perhaps Australia's most entrenched sporting rivalry – is less relevant to the sport than ever before. "Wheels wobbling on Ford-Holden rivalry, says V8 Supercars boss". Retrieved 12 February 2010. ^ "Chapter 10 - Breaking the Sound Barrier". Webs.lanset.com. Retrieved 2013-12-08. ^ "The Audi versus Peugeot war steps up a gear – AUTOSPORT". Autosport. 17 March 2011. Retrieved 2012-10-06. ^ Gordon Kirby (2012-03-29). "Segrave's record-breaking anniversary - History". Motor Sport. Retrieved 2013-12-08. ^ Marr, Andrew (2009-10-02). The Making of Modern Britain. ISBN 9780230747173. ^ "21 Jun 1938 - COBBS CHALLENGE TO EYSTON ATTEMPT ON RECORD Roll". Trove.nla.gov.au. 1938-06-21. Retrieved 2013-12-08. ^ "Utah's "Ugly Duckling" Salt Flats". Historytogo.utah.gov. Retrieved 2013-12-08. ^ "Classic Racing Rivalries: Nuvolari vs. Varzi" (2). Vintage Motorsport. March–April 2009. ^ "Classic Racing Rivalries: FANGIO vs. MOSS". Vintage Motorsport. May–June 2009. ^ "8W – When? – Italy 1947". Forix.com. Retrieved 2012-10-06. ^ Ronald Ahrens (August 2009). "FEATURES: Great Rivalries: IRL vs Cart and Breedlove vs Arfons". Automobile Magazine. Retrieved 22 March 2010. ^ "The Racing Campbells - Donald & Malcolm Campbell - Tom Green & Wingfoot Express". 21 August 2006. Archived from the original on 21 August 2006. Retrieved 22 November 2017. ^ "Craig Breedlove sets new land-speed record — History.com This Day in History — 11/15/1965". History.com. Retrieved 2013-12-08. ^ a b c d e f "Top 10 racing rivalries". Visordown.com. ^ He won what many historians consider to be the greatest Isle of Man race of all time, the 1967 Senior TT. That event pitted him against archrival Giacomo Agostini. "Ago," on the MV Agusta, faced off against "Mike the Bike," on the blazingly fast but ill-handling four-cylinder Honda. "Mike Hailwood". Motorcycle Hall of Fame. Archived from the original on 24 December 2009. Retrieved 12 February 2010. ^ Klaus Ewald (24 July 2006). "Pedro Rodríguez". Grand Prix Journal Online. Retrieved 13 April 2010. ^ "RACING RIVALS: LAUDA VS. HUNT" (Classic Racing Rivalries: Keke Rosberg vs. Gilles Villeneuve). Vintage Motorsport. March–April 2010. ^ "Ayrton Senna's rivalry with Fullerton – Video Dailymotion". Dailymotion.com. 15 June 2011. Archived from the original on 11 November 2012. Retrieved 6 October 2012. ^ "Karting News from Karting1.co.uk » Blog Archive » Senna's Greatest Rival – Terry Fullerton Stars at Senna Movie Screening". Karting1.co.uk. 6 May 2011. Archived from the original on 19 July 2012. Retrieved 6 October 2012. ^ "Terry Fullerton – the Norwich man Ayrton Senna had to follow – Motorsport – Eastern Daily Press". Edp24.co.uk. Archived from the original on 31 August 2012. Retrieved 2012-10-06. ^ A great rivalry existed at the height of Sheene's career between him and American racing legend Kenny Roberts. A big show was sometimes made of the pair's battles, which was depicting as a bitter fight between two racers who almost hated one another. "Barry Sheene". Retrieved 12 February 2010. ^ "The 'Punch and Judy' Award". F1 Rejects. Archived from the original on 5 May 2012. Retrieved 2013-12-08. ^ Rainey's intense rivalry with fellow American and 1993 world champ Kevin Schwantz was the stuff of legends. Their careers progressed together as did their mutual hatred of each other and whether it was in American national races, the Transatlantic Trophy in England or the GPs, they only cared about beating each other, even if that meant coming last and second last. Stuart Barker (18 May 2009). "I Love The 90s". Visor Down. Retrieved 12 February 2010. ^ "How Formula One today could do with a rivalry as bitter and compelling as this one. Two of the greatest drivers of all time, pitted repeatedly against one another. Stylistically they were different, but essentially it was personal." Matt Tench and Jamie Jackson (3 November 2002). "The top 10 greatest rivalries in the history of sport". The Observer. London. Retrieved 16 February 2010. ^ Foyt and Andretti were never friends, but neither were they enemies. Ayrton Senna and Alain Prost, by way of contrast, were oil and water. Or maybe gunpowder and a match is a more apt characterization. Their relationship was contentious enough while they were on separate teams, but paired together at the height of McLaren's F1 supremacy, they formed the ugliest – and most perversely compelling – rivalry in motorsports history. "Great Rivalries: Racing's Best Rivalries". Automobile Magazine. Retrieved 13 April 2010. ^ Alone at the top – For 2000, Millen's biggest rival, Nobuhiro Tajima will not be competing in the Unlimited Class. Instead, Tajima will bring a new vehicle to the Pikes Peak Open Class. While the overall title is still up for grabs, the six-year rivalry for the class title has ended. "Above the tree line – Rod Millen Shoots For 10-Minute Barrier". motorsport.com. 29 June 2000. Archived from the original on 6 June 2011. Retrieved 12 February 2010. ^ "Pikes Peak:Millen VS The Monster | wetheterrors – Alt rallying, Rallycross and rally". Wetheterrors.com. 25 June 2013. Archived from the original on 11 January 2016. Retrieved 10 October 2015. ^ That tussle of 1994 between Russell and Fogarty was the making of the sport as a spectacle that could attract millions. The Brit vs Yank, hard-knock lad vs spoilt brat head-to-head the media constructed around the 1994 season guaranteed an unprecedented level of exposure for Superbikes. Kevin Sampson (26 May 2001). "Ordinary hero". The Guardian. London. Retrieved 13 April 2010. ^ "Mika Hakkinen urges old rival Michael Schumacher to fight for recovery". Zee News. ^ Sam Tremayne (13 January 2012). "Matt Neal eager to resume British Touring Car rivalry with Jason Plato". Autosport.com. ^ Freeman, Glenn. "Loeb hails rivalry with Gronholm - WRC - Autosport". Autosport.com. Retrieved 2018-01-13. ^ The comparisons are inevitable. Both are Italian; both are multitime world champions fighting for the MotoGP title, as well as the favor of the mercurial and powerful Italian press. Their every move is studied, forcing both to seek refuge in foreign countries. "Forever In The Shadow". Sports Rider Magazine. February 2009. Retrieved 12 February 2010. ^ "Dixon vs. Franchitti -- the silent rivalry". Indycar.com. Archived from the original on 2 October 2015. ^ The season as team mates for rookie Hamilton and defending 2005 and 2006 world champion Alonso ended in the latters' bitter departure from the McLaren team amid conflicts with the team hierarchy with regards to involvement in Spygate and blocking Hamilton in qualifying at one event. The feud also saw drivers take points off each other to allow Kimi Räikkönen and Ferrari to come from behind to win by a solitary point over both. The two are yet to contest a world championship finale against each other since. "Lewis Hamilton vents fury at Alonso tactics". The Telegraph. 17 September 2007. Retrieved 1 October 2015. "Stories of the season: Hamilton vs Alonso". F1 Fanatic. 30 October 2007. Retrieved 1 October 2015. Galloway, James (11 December 2014). "Ron Dennis says Lewis Hamilton 'had his role to play' in McLaren's 2007 implosion". Sky Sports. Retrieved 1 October 2015. ^ Vettel won four world titles in a row between 2010 and 2013 at Red Bull, with Alonso finishing second on three occasions – two of the titles narrowly won in finales, denying Alonso his third title. Then as Alonso left Ferrari in late 2014, Vettel signed for the team as his replacement. The rivalry was fierce, yet respectful with few on-track clashes. Andrew Benson (25 November 2012). "Vettel and Alonso's rivalry becomes one with real teeth". BBC Sport. Retrieved 25 May 2015. ^ The two team mates at Mercedes were involved in several spats during the 2014 to 2016 seasons, fighting over the Drivers' Championship. "Lewis Hamilton v Nico Rosberg: Childhood friends to arch rivals". BBC Sport. 12 April 2015. Retrieved 1 October 2015. ^ Reigning MotoGP world champion Valentino Rossi says he is looking forward to renewing his rivalry with former foe Sete Gibernau in the 2009 MotoGP world championship. "Valentino Rossi looking forward to new Sete Gibernau battle". Motorcycle News. 13 November 2008. Retrieved 12 February 2010. ^ "'The rivalry with Pearson was strictly trying to beat each other,' Petty said. 'There were no confrontations or anything. With Allison, it got to be more personal. We got into personal arguments. You didn't need to with Pearson.'" David Newton (29 August 2008). "Top rivalries marked by crashing cars, flying fists and swinging helmets". ESPN. Retrieved 16 February 2010. ^ "Surpassing these and others is a rivalry forged not so much out of jealousy or bitterness, as much as it was two giants immersed in a supreme struggle for supremacy, because winning is the name of the game. To this observer, the greatest NASCAR rivalry of all time was the ongoing tussle between the man they called "The King," and the ever sly "Silver Fox." "They Call Him "The King," Part III- The Greatest Rivalry". 27 December 2009. Archived from the original on 21 January 2010. Retrieved 16 February 2010. ^ "The feud reached a boiling point during the final three laps of a 1972 race at North Wilkesboro (N.C.) Speedway. Petty was leading on Lap 367 when Allison drove low to make a pass. Petty cut him off, using another car to block." David Newton (29 August 2008). "Top rivalries marked by crashing cars, flying fists and swinging helmets". ESPN. Retrieved 16 February 2010. ^ "This rivalry was defined by the last lap of the 1979 Daytona 500. Cale Yarborough was fighting Donnie Allison for the lead when, as Yarborough recalls, he was shoved into the infield grass. He somehow steered his car back onto the track and slammed into the side of Allison's car, spinning both out." David Newton (29 August 2008). "Top rivalries marked by crashing cars, flying fists and swinging helmets". ESPN. Retrieved 16 February 2010. ^ "The hatred Allison and Yarborough shared for Waltrip was no secret in the garage. "We had been friends, and I had helped him early in his career," Allison said. "In fact, I had built cars for him before he got into the Winston Cup stuff. But he didn't want to be friends. It just kept us from cooperating on any kind of an effort that would have been good for both of us."" David Newton (29 August 2008). "Top rivalries marked by crashing cars, flying fists and swinging helmets". ESPN. Retrieved 16 February 2010. ^ Which is why Jeff Gordon's arrival in the early '90s caused so much controversy and soul-searching about the fundamental nature of the sport. "Great Rivalries: Racing's Best Rivalries". Automobile Magazine. Retrieved 13 April 2010. ^ a b "NASCAR Sprint Cup: The 20 Biggest Rivalries In NASCAR History". Bleacher Report. 12 December 2010. Retrieved 2012-10-06. ^ "Jimmie Johnson sounds off on Kurt Busch". CBSSports.com. 7 August 2011. Retrieved 2012-10-06. ^ "Great Rivalries: Racing's Best Rivalries". Automobile Magazine. Retrieved 13 April 2010. ^ Ronald Ahrens (August 2009). "Great Rivalries: Don Prudhomme vs Tom McEwen". Automobile Magazine. Retrieved 13 April 2010. ^ "Classic Racing Rivalries: Larry Dickson vs. Gary Bettenhausen". Vintage Motorsport. September–October 2010. ^ "Deseret News", 'French Dominate Climbing Meet at Snowbird", June 13, 1988. ^ Netball New Zealand (2011). "World Netball Championships History". Netball New Zealand. Archived from the original on 30 April 2012. Retrieved 3 January 2012. ^ Lutton, Phil (16 July 2010). "Broncos get more bang from another young buck in win over Titans". Sydney Morning Herald. ^ "Wests Tigers demolish Raiders". NRL.com. 26 July 2009. Archived from the original on 29 September 2012. Retrieved 6 October 2012. ^ "Bulldogs and Parramatta rekindle their bitter rivalry". Sydney Morning Herald. 4 April 2003. ^ "Film Camp". The Fibros and the Silvertails. Retrieved 2012-10-06. ^ Stevenson, Andrew (1 August 2009). "Dragons' fire douses Storm's hopes". The Age. Melbourne. Archived from the original on 5 November 2012. ^ "PRIME7 – Yahoo!7". Canberra.iprime.com.au. Archived from the original on 6 July 2011. Retrieved 2012-10-06. ^ "Sharks v Storm Preview". NRL.com. 14 July 2010. Archived from the original on 29 September 2012. Retrieved 6 October 2012. ^ "Broncos v Storm Preview". NRL.com. 14 July 2010. Archived from the original on 29 September 2012. Retrieved 6 October 2012. ^ "Rivalry drives Knights – League – Sportal Australia". Sportal.com.au. Archived from the original on 14 March 2012. Retrieved 6 October 2012. ^ Monahan, Jeremy. "NRL: Rabbitohs: The rivalry between South Sydney Rabbitohs and the Sydney Roosters is legendary – Rugby League – Sport – Southern Courier". Southern-courier.whereilive.com.au. Retrieved 2012-10-06. ^ Tasker, Norman (2005). State of origin: twenty-five years of sport's greatest rivalry. Caringbah, New South Wales: Playright Publishing. ISBN 978-0-949853-93-6. ^ "The rivalry – Kiwis v Kangaroos – Yahoo!7 News". Yahoo! News. 20 October 2009. Archived from the original on 22 September 2012. Retrieved 6 October 2012. ^ "RL1908 - Rugby League Ashes battles - Australia v England". 31 October 2009. Archived from the original on 31 October 2009. Retrieved 22 November 2017. ^ "New Zealand Rugby League History - RL1908.com". 24 September 2010. Archived from the original on 24 September 2010. Retrieved 22 November 2017. ^ a b c "Rivalries to make Origin look tame". Foxsports.com.au. 28 February 2014. Retrieved 22 November 2017. ^ "Preview: Stade Toulousain v Stade Français". Planetrugby.com. Archived from the original on 11 November 2014. Retrieved 11 November 2014. ^ "Biarritz v Bayonne the weekend Top 14 highlight". Rugby Week. 28 February 2013. Archived from the original on 10 May 2013. Retrieved 19 May 2013. ^ "TOP 14, J16 - Clermont - Brive : 9 essais dans le derby du Massif Central" (in French). Ligue nationale de rugby. 10 January 2015. Retrieved 24 June 2015. ^ "Rugby / Pro D2 : Béziers domine le derby face à l'Usap (27-22)". Le Midi Libre. 17 December 2015. Retrieved 10 February 2016. ^ "Irish Rugby". irishrugby.ie. Retrieved 22 November 2017. ^ "It's time for Zebre to change their stripes as Italians seek upturn in fortunes". Herald Scotland. ^ a b c Austin, Andrew (3 August 2011). "The rivalries: Battle against Boks fiercest clash of all". The New Zealand Herald. ^ Portway, Huw (19 November 2012). "A rugby rivalry – Wales v New Zealand". Welsh Sport News. ^ Cary, Tom (3 August 2012). "London 2012 Olympics: Ben Ainslie's Danish rival Jonas Hogh-Christensen is public enemy No 1". Daily Telegraph. Retrieved 2013-12-08. ^ Hodgetts, Rob (2012-08-02). "Olympics sailing: Ben Ainslie angry with Finn rivals". BBC Sport. Retrieved 2013-12-08. ^ Branch, John (10 February 2018). "South Korea Goes Wild for Short-Track Speedskating (and Its First Gold)". NYTimes.com. Retrieved 10 March 2018. ^ Zaccardi, Nick (20 March 2014). "Maria Hoefl-Riesch retires from Alpine skiing". NBCSports.com. Retrieved 10 March 2016. ^ Moore, David Leon (17 February 2010). "For Lindsey Vonn and Maria Riesch, friendship & rivalry blur". Usatoday.com. Retrieved 10 March 2016. ^ Johnson, William Oscar (27 January 1988). "Smooth as Clockwork". Sports Illustrated. Retrieved 10 March 2016. ^ Verschoth, Anita (27 January 1988). "The Mouse May Roar". Sports Illustrated. Retrieved 10 March 2016. ^ LeMaster, Ron (2010). Ultimate Skiing. Champaign, Illinois: Human Kinetics. p. 120. ISBN 978-0-7360-7959-4. ^ "Janica Kostelic: 'It's nice to be on the other side'". Federation Internationale de Ski. 9 September 2013. Retrieved 12 March 2016. ^ Spencer, Adam (20 February 2015). "Ted Ligety reflects on success at World Championships". Park Record. Archived from the original on 15 March 2016. Retrieved 14 March 2016. ^ Zaccardi, Nick (23 June 2014). "Memorable U.S.-Germany Clashes in Olympics". NBCSports.com. Retrieved 14 March 2016. ^ "Dorfmeister has a new will to win". Hürriyet Daily News. 11 December 2004. Retrieved 14 March 2016. ^ "Henrik Kristoffersen excited to reignite rivalry with Marcel Hirscher". International Ski Federation. 28 September 2018. Retrieved 28 September 2018. ^ Cooper, Thomas (29 January 2016). "Svindal, Jansrud and the Sad, Abrupt End to Norway's Friendly World Cup Rivalry". Bleacher Report. Retrieved 19 November 2018. ^ "Aksel Lund Svindal beaten by teammate Kjetil Jansrud in his final race". ESPN.com. 14 February 2019. Retrieved 16 February 2019. ^ Pepin, Matt (26 November 2017). "Mikaela Shiffrin dominates to win World Cup slalom at Killington". boston.com. Retrieved 16 February 2019. ^ Dampf, Andrew (13 February 2019). "Slovakia's Petra Vlhova is a 'very strong rival' for Mikaela Shiffrin". The Aspen Times. Retrieved 16 February 2019. ^ a b Pretot, Julien (18 February 2014). Woodward, Robert, ed. "Olympics-Biathlon-Good to have you back, Emil, says gracious Fourcade". Reuters.com. Retrieved 26 December 2016. ^ Belson, Ken (18 February 2014). "For Norway, a Cross-Country Crisis". NYTimes.com. Retrieved 10 February 2018. ^ Crestodina, Thomas (28 February 2010). "Kowalczyk Takes Gold". Krakow Post. Retrieved 4 August 2016. ^ a b "Surfing's Greatest Rivalries | Transworld Surf". Surf.transworld.net. 12 December 2008. Archived from the original on 19 December 2008. Retrieved 6 October 2012. ^ "Paralympics 2012: Eleanor Simmonds rival Victoria Arlen still awaiting reclassification after eligibility issue". The Daily Telegraph. London. 30 August 2012. Retrieved 2012-10-06. ^ Kelso, Paul (8 September 2012). "Paralympics 2012: Victoria Arlen beats odds and Ellie Simmonds to finish with gold medal flourish". The Daily Telegraph. London. Retrieved 2012-10-06. ^ "Michael Phelps and Ryan Lochte will duel for final time in 200 IM - Ann Killion". Sports Illustrated. 1 August 2012. Retrieved 2012-10-06. ^ "Tyler Clary won't back up trash talk vs Michael Phelps in 200-meter butterfly". Bleacher Report. 31 July 2012. ^ "Phelps' Beijing rival Milorad Cavic retires". NBC Sport. 10 October 2012. ^ "Olympic Swimming Preview: Milorad Cavic Renews Rivalry With Michael Phelps". SB Nation. 2 August 2012. ^ "Convalescing Cavic concedes to Phelps _ for now". USA Today. 20 June 2011. ^ "Commonwealth Games: Adam Peaty expects long rivalry with world star Cameron van der Burgh". The Sentinel (Staffordshire). 29 July 2014. Archived from the original on 3 August 2014. Retrieved 30 April 2016. ^ Newberry, Paul (8 August 2015). "Michael Phelps answers rival Chad le Clos' trash talk with top time in 100-meter butterfly". baltimoresun.com. Retrieved 4 August 2016.